Sony introduced their 3rd generation electronic book reader PRS-700 that will become available in the market in November and will cost US$400, $100 more than the PRS-505 model that currently on sale. The PRS-700 weighs 10 ounces (280grams) and comes with a stylus that readers can use to highlight text in an e-book or write their own marginalia. The PRS-700 can hold up to 350 books with built-in, internal memory, but voracious readers can expand that amount by using a removable memory stick. It’s compatible with e-book formats including Sony’s BBeB (Broadband electronic book), Microsoft Word documents, Adobe PDF and the International Digital Publishing Forum’s XML-based EPUB format. The PRS-700 uses similar 6-inch electronic paper display to that used in the PRS-505, but added a touch panel and a reading light. The touch panel means users will be able to turn pages on-screen and also search through e-books using an on-screen keyboard and highlight passages using a stylus. The light will aid reading in dark environments. Sony’s biggest competitor in the e-book space, Amazon.com, also appears ready to launch a new version of its Kindle reader. However, Amazon has yet made any official announcement. 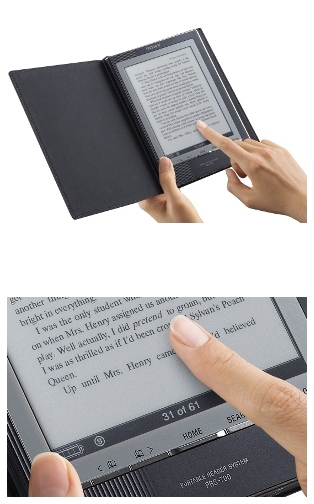 The PRS-700 does not have an equivalent of the Kindle’s signature feature, i.e. wireless access to Amazon’s e-book store for near-instant book downloads. Instead, books are loaded on to the device by connecting to a PC. Steve Haber, president of Sony’s Digital Reading Business Division, said the company aims to have a wireless version, but it would have to work with multiple book vendors.